Life is not like the movies. You don’t just wake up in the morning, hop out of bed and look into the mirror to see that you are automatically healthy, wealthy and content. Life requires persistence and hard work. Building new things is an essential, yet challenging part of life. It doesn’t matter if it is a business, your health, or building relationships, all of these things take incredible amounts of time and dedication. I’ll be honest, I’ve been attracted and sucked into the many “get what you want quick” types of ideas that are floating around. The snake oil salesmen say that all you have to do is try a few simple tips and tricks and everything will just work out. Just buy this book, or program and you will get what you want. But usually, that’s just not the case. As it turns out, it is actually pretty difficult to build up and improve things. It takes incredible amounts of time, money and effort to pull off. And in fact, there isn’t even any guarentee that you will be able able achieve them. Some things simply don’t work. The goal of this book is to provide a basic framework and a few stories about persistence and hard work, while being completely honest about the true difficulties that go along with growing something new. It is my hope that you reading this book feels as though you are being spoken to honestly. Over the past number of years, I’ve been working to build up a business and also many other aspects of my life. It definitely hasn’t been easy, but it’s been a great experience. What I’ve learned is that years of dedicated work are often required before you’re able to reach your goals. It is really quite easy to set a goal in mind. Only when you actually begin walking towards the top of that mountain do you get a chance to really deeply feel how challenging many goals truly are. I write this book not as a boastful entrepreneur looking back on all of his success, but rather as an equal. Someone who is also in the trenches alongside you. I am here in Colorado, day in and day out, trying to achieve my goals and dreams as well. I wanted to write this book written for the hard working people. The normal people like you and I.
Oh and choosing this. There are approximately 2,200,000 books published each year. It means a great deal to me that you decided to choose this one to check out. Ok, so have a number of goals and plans for things you would like to achieve over the next few years. What does it take to actually begin these huge projects? What are the catalysts that get people off their butts and begin the process of moving towards the achievement of their goals and dreams? Dallas Carter was born and raised on the beautiful island of Oahu, Hawaii. Hawaii is known for many good things, but it also ranks as the second most obese state in the US. Dallas was raised on the local Hawaiian diet that included many unhealthy foods, like Hawaii’s popular treat, Spam. In high school Dallas weighed in at an impressive 280 pounds. He signed up to participate in the high school’s obesity program, but he didn’t actually do much to change his lifestyle. During college he continued to eat unhealthy foods and maintained a sedentary lifestyle, and he continued to gain weight. At one of his doctor checkups, he stepped on the scale and the word “error” blinked across the screen. The scale had a maximum weight of 350 pounds, and he had exceeded that. He later went to a specialty doctor who had a special scale, which showed that his weight was now up to 370 pounds. As he recounts later, this meeting moved him slightly, but even the doctor telling him that he could die young was not enough to encourage him to make any substantial changes in his health. From that day forward Dallas knew he had to change. He began his journey with a very simple goal; he was determined to lose just 50 pounds. He walked into his garage and wrote the number 50 on a whiteboard. Over the course the next week he began improving his diet in small ways and started taking daily walks around the block. These walks would leave him winded after just 10 minutes. The first week he lost zero pounds. He was a bit disappointed but he continued forward. By the time he weighed himself after the second week, he was happy to see that he was down 3 pounds. He had made some progress. He took his marker, scratched a line through the 50 and wrote 47. Each week he continued to improve his diet and do moderate exercise. Before long he had lost 40 pounds and there was a 10 left on his board. “I can keep going,” he thought to himself. And so he did. He continued on, scratching out the 10, and writing another 50 in its place. Day after day, month after month, year after year, Dallas continued his healthy eating and healthy exercise game plan. He looks back on that time and calls it “extremely grinding” and says that it was “One of the hardest things that I’ve ever had to do.” But he says that it became easier as he grew more accustomed to it. What started at a difficulty level of ten soon became a nine, and then an eight. After three and a half years of diligent and difficult work, Dallas had achieved an amazing thing. He was finally at a healthy weight. He wore a medium shirt, had a 34 waist and a weighed just 181 pounds. His story has inspired countless other Hawaiians to change their diets and improve their health. He works with a number of clients who he encourages to continue working on their journeys. Yet, he warns that it’s not easy. Imagine for a minute that you hired a special personal trainer. When you sat down with him for your very first session he smiled and told you that all you had to do was one single workout. Just this one workout with him and you would achieve the best shape of your life. However, this one workout would last for 156 hours straight with no breaks. How would you respond? You would think that he must be crazy, and you would probably stand up and leave the gym immediately. Instead of taking his ridiculous advice, what you might start doing instead is working out for one hour every every couple of days. Eventually these smaller workouts would end up totaling the same 156 hours of exercise over the course of a year (3 hours a week x 52 weeks). This would be the same amount of total time and yet would be a much more realistic approach and would ultimately be way more beneficial to you and your body. I think that this is analogous to many of our goals in life. We typically have enormous projects that we would like to accomplish, and the only way in which we can possibly accomplish these projects is by breaking them down into much smaller tasks. Looking at the completed goal all at once can be overwhelming, and finishing it in one sitting is often impossible. The Olympics is one of the most competitive and highest levels of sport in the world. To achieve the goal of qualifying as an Olympic athlete requires obsessive levels of work and dedication. An athlete’s training is often a full time job. Many athletes train three times each day, six days a week. When they’re not training, they’re often resting and eating in preparation for the next session. This training often takes eight years or more before an athlete can make his or her first Olympic team. Olympians set their lofty goals of qualifying for and hopefully winning a medal at the Olympics many years in the future. They diligently prepare years to try to accomplish these goals. They break down their dream into more manageable parts, and with their coaches, focus on daily training activities that will get them closer to their dream. For example, the training program for an Olympic swimmer consists of swimming, weight training, stretching and recovery, mental preparedness, and nutrition. All of these factors play a major holistic role in getting a swimmer into their best shape, and it is extremely important to balance it all. Because of the intensity of his workouts, Michael Phelps needed to consume 12,000 calories a day when in training. His focused regimen helped him obtain 22 Olympic medals. For us normal folks, we also can display a similar type of focus and create our own regimens. Although not as intense as that of an Olympic athlete, we can pick up specific habits to help us grow and improve our lives. We can adopt the principles of repeatedly training and building towards the big goals in our own lives. We might not have an expensive team of professional coaches and nutritionists to guide us along our way. However we can take some of the ideas that Olympians use and apply them to our life. We can keep working towards our big goals by breaking them down into accomplishable daily tasks. One of the most useful ways to organize the daily tasks that you are trying to accomplish is to write them down and keep track of them. One of the ways that I’ve been able to help focus my life is by using an excellent habit-building tool on my iPhone called Lift. This app helps me repeatedly accomplish daily tasks. Here is an example of a few things in my life I am working on every day. Another option is simply to get a pen and paper and write down the daily tasks that you’re trying to accomplish. Whichever method you use, repeatedly working on tasks to get closer to your goals is a manageable way to accomplish great things. By doing specific tasks a few times a week or maybe even each day, we can build habits that move us closer to what we want to achieve. Have you ever stayed up all night long working on a school paper that is due the next day, when all of a sudden, your computer crashes and the paper is lost? All your hard work is deleted. 2. You have better focus the second time around, so the quality becomes even better than it was in the original. Life is very much like this. When we are working on something difficult it is often very challenging the first time we try it. However, the second time is usually considerably easier than the first. And as we continually practice, the task becomes something that we are more accustomed to doing. Dallas Carter spoke about this in regard to weight loss. The first couple workouts were pretty difficult for him, but after he did it over and over and over again, he grew more familiar with it and it became much easier. Not completely easy, but easier. If you think about it, any song you have heard on the radio was probably the 1,000th or maybe the 10,000th song the artist had sung. It’s easy to gloss over all the hard work that came before leading up to a beautifully produced piece of work. It’s like anything, the more times you practice it, the easier and faster it gets. It was 2004 and Scott Harrison was living life in the fast lane. He was one of the main promoters of a well-known New York City nightclub. He wore a Rolex, drove a BMW and went out several nights a week. His address book was filled with the names and phone numbers of countless models, actors and millionaires. He was living the high life in New York City. On a trip to Puerto Vallarta, Mexico, filled with partying, he hit an all-time low. His life would have to change. He returned to New York and tried to figure out what the opposite of his selfish life in the city would look like. He made the bold decision to sell most of his belongings and sign up for a one-year commitment aboard a floating hospital. He was going to be working with an organization called Mercy Ships, which offers free medical care to people in some of the poorest nations all around the world. He traded in his fancy New York loft for a 150 square-foot cabin complete with bunk beds, roommates and cockroaches. Scott worked as a photojournalist on the ship. Every day he would go out and take photographs of all the patients that were coming into the floating hospital. He witnessed incredible scenes of disease and poverty. He spent a year photographing individuals who needed all different types of medical care, from basic medicine to complex operations. One of the most amazing experiences that he encountered was meeting a disfigured 15-year-old boy. This boy had an enormous abscess on the side of his face. It was so big that it was preventing him from breathing correctly. After numerous surgeries by the volunteer medical staff, the boy was finally able to chew again and was no longer being suffocated by his tumor. After a year of volunteering for Mercy Ships Scott returned to New York City, but not to his old way of life. He knew he had to do something different. One night, while at a club holding an expensive martini in his hand, he began putting together the idea of creating a new charity. This new charity would work on fighting back against one of the main problems that he saw aboard Mercy Ships. That problem was water-borne diseases and the lack of access to clean water. He would call his new organization Charity Water. Over the course of the next six years, Charity Water would grow and grow. Their mission was to raise money to help charities around the world that focused on water. He would give 100% of all donations directly to the organizations on the ground providing water to the poorest of the poor. He would accomplish this goal by establishing a separate fund where donors could help give money for the operating expenses of Charity Water. I spoke to Scott a few years back and he shared with me an incredibly ambitious goal. He told me he wanted to raise $100 million and give all the money directly to water projects around the world. Reaching this ambitious goal would still only be enough to confront about 1% of the world water problem, a problem that will require more than a billion-dollars to eradicate. He was, and still is, incredibly determined to reach his goal. The great news is that Scott, his team, and network of donors are already over 60% of the way towards his goal. As you read this they may even be closer. It’s amazing to see him and his team of almost 50 employees working diligently day in and day out to raise money to provide water for those in need. Taking the time to select quality people can greatly help you along your journey. Good people can help support you through the rough patches that you will undoubtedly face. Oftentimes in the entrepreneurial world, many start up incubators do not even accept solo founders. They realize that the journey to create a brand new business is such a difficult one that it is important for two or more co-founders to work and support each other together. There is an amazing occurrence that happens when you work with other people on a project. Oftentimes if you and your co-worker do one hour of work together, you actually get the equivalent of about 3 hours of work accomplished. One plus one equals three. I’ve had this experience happen to me numerous times recently. I realized one of the main mistakes I’ve made over the past number of years is not asking additional people to help me at an earlier stage. Team building is often like selecting different characters in a video game. Some are faster, or more resilient, or have special weapons. Individuals in the workplace are often like this as well. One person might be more visual, while another might be an excellent leader. One might be more technically inclined. The right combination of people can result in a powerful team. The team is stronger because of the differences. You may think that building a team always requires large amounts of money. However, this doesn’t always have to be the case. You can build a team of supporters and mentors that don’t require any money at all. You can hire interns and college students. Also instead of offering full-time positions, you can start with part-time positions. Even a part time worker can be an enormous asset to your project. The bottom line is that it’s worth taking the time to think outside the box to find people that can help you. It’s easy for determined people to have blinders on. They are oftentimes so intently focused on the work that they’re doing that it is difficult for them to take the time to see how the people around them are feeling. However, it’s vital to treat the people that we are surrounded by well and with respect. When you’re younger you often think that the people you are around have to be your friends. However, as you grow up it becomes clear that you actually have the ability to choose your friends. You can take the time to select people that actually make you feel good and encourage you to be a better person. You can take steps to avoid toxic people — those that leave you feeling drained after you spend time with them. It’s your choice. When you’re speaking with someone, listen to them intently. Teddy Roosevelt was known for this quality. He would give any person his undivided attention, no matter if they were a senator or a janitor. He also made the effort to remember the names of their family members. So you’re at a party, and you’re talking to someone. As they begin to speak with you, you notice they keep on glancing off your shoulders looking behind you to the other people at the party. “Shoulder surfing” is the practice of speaking with one person while looking over his or her shoulder to see if you can find somebody more interesting or more helpful to you. It’s easy to try to find different people to help you out, but resist the urge. Take the time to actually listen to the person in front of you and what they have to say. It’s good to have someone to confide in. When things get a bit rough in your life it’s always nice to be able to share your frustrations with another person. However, when you begin to share your frustrations with multiple people it turns into gossip. This type of venting and negative talk can be detrimental and should be avoided. When I was in college I worked for a guy who was setting up an Internet company. At one point he specifically requested that I not be a part of the management team. This stung quite a bit, as I was one of the first employees. Instead of getting angry, yelling at him and burning a bridge, I let the problem go and time passed. Interestingly enough, five years later I was in New York City and I needed a place to stay because my housing had fallen through. I gave this guy a call, and sure enough, I was able to stay at his house for a couple of days. If I had burned that bridge earlier, I would not have had this option. What I learned from this was to not burn bridges simply because you can. Take the high road because you never know what might happen in the future. You never know when you might run into somebody again. Boundary setting is one of the most important things that I’ve learned in my life. No one likes to say no or set boundaries. It feels as though you’re not being “nice”. But proper boundary setting is vital for dealing with difficult people and with commitments that take up too much of your time. By saying no to certain things we are better able to say yes to the things that are truly important in our lives. Being generous applies not only to money, but also to knowledge, goods, services and many other things. Its important for us to switch from a “what can I get” to a “what can I give” mentality. And being generous has an interesting side to it. Oftentimes when we give to others we end up receiving so much in return. Martha Willoughby grew up in Georgia. She studied pre-med and then went on to medical school. While there she met her husband Mike, and they both became doctors. She became the medical director at a hospice center and her husband opened a private practice. A few years after being married, they began having children. They had Tim, Bryan, Rachel and Paul. Their lives were going smoothly. They had built a beautiful house right next to the river in Augusta, Georgia, and their lives were pretty well set. Martha had retired from medicine and cared for the children while Mike worked at his private practice in town. Then Martha became pregnant again. At her five month checkup the doctor uttered the words that a mother never wants to hear: “I’ve got some bad news.” It turned out that the doctors suspected that the baby inside of her had some sort of problem. The doctor encouraged Martha to abort the child. With her Catholic upbringing and her strong morals she didn’t even consider that to be an option. Nathan Willoughby was born in 1991. He had Down syndrome. Martha was overcome with numerous emotions that very first week after he was born. “I cried all week long,” she said. Their family doctor, whom they had been friends with for many years, was distraught and made the strange statement, “I’m so very sorry, I guess you’ll never have a vacation again.” The Willoughby’s have since been on many family vacations. Growing up, Nathan was different from the other children. He required more assistance and developed at a slower pace. It would take him longer to understand a certain situation and required help from his siblings and parents. But he also brought an extra joy to the Willoughby household. He introduced countless humorous situations that they would have missed because he saw situations with a more childlike eye. He approached most things in life with a huge smile. And there wasn’t very much that he couldn’t do. “All the kids were climbers — they would climb trees and whatever they could get their hands on” Martha said. “This was something I was concerned about for Nathan. But as it turned out he grew up and became a climber too”. She shared how one of her favorite stories was about an ultramarathon runner who nearly gave up halfway through an incredibly grueling 100-mile race. The runner sat on the pavement completely exhausted and was about to give up. An interesting thought came to him, what if he simply started over. So he stood up and began again and ended up finishing the race. Her expectations for her life have been changed as she will probably have to provide care for Nathan for many, many years to come, but she does not regret these challenges and opportunities that she has been given. We’ve all had really bad days. You are trying to crank forward and are working so hard to achieve your goals, but today nothing seems to be going right. It feels as though you are walking through quicksand and you just can’t keep going. You feel burned out. It feels as though you just ate ten hamburgers and are supposed to eat one more, but you just can’t seem to bring yourself to do so. Things that you are trying to accomplish just aren’t coming together or following through. It’s a crappy day. Don’t worry, these types of days happen. I’ve been through many of them myself and I’m sure you have too. Here are a few ideas for making this day go a little smoother. Sometimes when you hit a roadblock you just have to put down the project and give it some rest. Picking the project back up in a couple of days may give you a whole new sense of encouragement to keep going strong. So give yourself permission to take a break and recharge. Have you eaten and gotten much sleep? Sometimes I realize that when I’m feeling like crap, or when I’m feeling depressed, it is simply my body being tired. It is sometimes difficult to actually know how tired or run down we really are. Unfortunately, we don’t have a clear feedback system that works like the fuel gauge in our cars. Take some time to try to determine how tired or hungry you really are. Another way to get your head off the project is to get some exercise. Go to the gym. Attend a yoga class, swim some laps, go for a run or lift some weights. Exercise can help clear your head and give you a fresh perspective along with that endorphin fueled runners high you get when you have finished the workout. After you hit the gym and get some food in you, maybe you can get a chance to connect with some friends. A lot of entrepreneurial activities can isolate people. So take the opportunity to call a few friends and try to arrange a lunch or get together. Being around friends and family will help get you to a better place. One of the most interesting things that I’ve learned over the past 10 years or so is that the way you feel in your body is extremely influential to how you feel in your head. If you want to feel more mentally relaxed and at peace, one of the ways to do this is to work on eating well, getting enough sleep and exercising your body. Work and projects don’t fit neatly in a box. You don’t simply go to work from 9 to 5 and get exactly 8 hours of productive work done at a 100% productivity level. Work happens in cycles and at different times of the day. Taking the time to try to understand how you work best and what your peak times of work are can be very helpful. Day in and day out, keep focusing on your goals and move towards them. Even if it’s only the very smallest step that you can bring yourself to take, go ahead and make that step in moving towards what you want to accomplish. Abraham Lincoln is one of the most well-known and admired figures in American history, but there is a lot about his life that you may not know. Both the personal and professional sides of his life were overcome with discouragement, heartbreak, and countless failures, but still he was able to keep moving forward and eventually he succeed. Lincoln’s life was filled with hardships and turmoil since day one. Growing up in rural Kentucky, Lincoln’s family was poor and he received little formal education. It was constantly a struggle to be financially stable, and so he often chopped wood to make extra money. As an adult he had four sons with his wife Mary. Only one of them lived past the age of 18. The emotional turmoil of these three deaths caused Lincoln to suffer from severe depression and experience nervous breakdowns. Lincoln’s early professional life was also difficult. He first ran for a political position in the Illinois State legislature in 1831, only six months after moving to the state. He came in 8th out of 13 candidates. But Abe didn’t let this get him down. Three years later Lincoln ran for the state legislature again, and this time he won. Despite his controversial politics, he was supported by both Republicans and Democrats. He ended up serving four consecutive terms. Lincoln had an interesting strategy that set him apart from other politicians; it consisted of building personal relationships, shaking hands and telling jokes. He had no platform statement, made no promises and rarely gave speeches. In 1846, Lincoln ran for a position in the United States House of Representatives, and he won. However, he was angered by the politics surrounding the Mexican-American War, and after boldly opposing President Polk and his statements in a passionate speech on the House Floor, he returned home to Kentucky to be a lawyer. The pro-slavery basis of the Kansas-Nebraska Act reinvigorated Lincoln’s interest in politics, and so he ran for Senate in 1854. He lost that election and proceeded to run again two years later. He lost that race as well. He was also in the running to be a Vice Presidential Candidate at the time, but he failed to get the nomination. Despite the numerous setbacks and losses, Lincoln’s performance in the debates leading up to the elections earned him the reputation as a skilled and passionate speaker. In 1858, Lincoln once again ran for a seat in the senate, and again he lost. However, the race gave national visibility to the issue of slavery and he was able to secure the presidential nomination from the Republican Party for the 1860 presidential elections. Going into the election, Lincoln was not favored to win. He had no support from the South. He was able to sweep the northern states though, which was just enough to get him elected. It was one of the most polarizing elections in history, as seven states proceeded to declare their secession from the Union. President Lincoln was then faced with the task of ensuring the freedom of all Americans and of keeping the country together while it was fighting a war against itself. He was re-elected in 1864 because of his appeal to the American people and his incredible oratory skills. But his policies and personality were blasted by politicians on both sides. Clearly he was on the right track though, because he was ultimately able to abolish slavery and succeed in keeping the Union intact. He ended up being the perfect president for one of the most critical points in the history of the United States, and to this day he is seen by many as one of the greatest American presidents of all time. After so many failures, it is incredible that Abraham Lincoln did not give up. Nothing about his life and his journey were easy. He was a passionate individual whose morals fueled his accomplishments, and that is ultimately how he is remembered. If you add it all up, Lincoln lost a total of eight political elections and had two failed business attempts. On top of all that, he had to deal with nervous breakdowns, instability, and the incredible heartbreak of losing three children. Let Abraham Lincoln’s tenacity, determination and fervor inspire you to keep going. The often-unwritten truth is that many successful businesses take upwards of 10 or more years to mature. 10 years! This is an incredible amount of time. As they say, Rome wasn’t built in a day. Actually, Rome was built over the course of about 500 years, and continues to be built as we speak. Starbucks was actually started in 1971 and after 8 years only had a few stores. It took Amazon 9 years to make a dollar in profit. Great things take time. Having a good idea does not instantly make you successful. It can take years for that idea to pick up steam. In the case of James Dyson, it took 15 long years and over 5,000 prototypes to come to a successful product. That product was a vacuum cleaner. Sir James Dyson studied furniture and interior design at the prestigious Royal College of Art in London. After school he helped design a high-speed landing craft called the Sea Truck, before setting off with designs of his own. Dyson’s ideas were almost always inspired by personal frustrations. Many of these frustrations were with household items and tools that he felt should just work better. His first project, “the Ballbarrow”, was an updated version of the wheelbarrow. He was tired of his wheelbarrow getting stuck in the mud when he was gardening, so switched out the classic wheel for a plastic ball that allowed for maneuvered more easily. Similar frustrations and similar mechanical ideas lead him to his vacuum-cleaner design. He was upset by the poor performance of the bag system in his vacuum, so he set out to create a new, more efficient version. This version would have no bag and would rely on centrifugal force to separate dirt from the air. This was in 1978. Dyson built prototype after prototype. After 5,127 versions, Dyson had a workable bagless vacuum cleaner, but no company wanted to buy it. Eventually he was able to make and sell his “G-Force” vacuum cleaner in Japan. The years that followed were filled with legal battles that nearly forced him into bankruptcy, as he sued many companies for patent infringement. Thanks to his product’s success in Japan, however, he was able to open a factory in England in the early 1990s. In 1993, the Dyson DC01 vacuum cleaner went on the market in Britain, and within 18 months it was the best-selling vacuum cleaner in the country. The vacuum wasn’t launched in the United States until 2002, but by 2005 he had captured 20% of the market of vacuum-cleaner sales. His company remains privately held, but it is estimated that as of March 2013 Sir Dyson himself was worth about $4 billion. Today his products are exported to 50 countries and he has 2,500 employees worldwide. It took James Dyson about 15 years to achieve commercial success. You might even have one of his vacuums. Today he is clearly a successful businessman and entrepreneur, but the road to where he is now was in no way easy. I want you to be happy and successful. I hope that you are able to move closer to the dreams that you have set for yourself. I hope you are building up your health, your relationships and your work life. I may not have met you in person yet, but I am rooting for you. I want you to achieve that which you have set out to do. Over the course of the past number of years there have been many times where I found myself pretty much by myself, working hard, alone in my room. Sometimes it felt as though there was no one there cheering me on. I don’t want you to have this same feeling, I want you to know that there is at least one person rooting for you. Thanks for taking the time check out this book. I very much appreciate it. I hope you got a few things out of it, and going forward I really do hope it encourages you to continue cranking on the projects and goals you’re working to achieve. 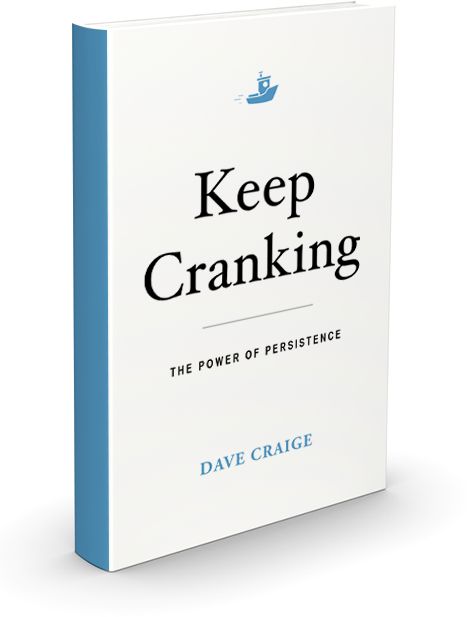 There’s so much more to explore in regards to the topic of persistence. You probably have some friends that have an amazing story. Or maybe you have some examples of hard work and persistence from your own life. Also if you know anybody who would like to read this book, please tell them about it. The best marketing is word of mouth. Also if you get a chance please follow me on Twitter . I really want to send a shout out to all of the people that have helped me so much with this book. Thank you to our great Tugboat team — Sydney Hodgson, Jayne Swallow, Mike Lockwitz. This project wouldn’t exist without you. Thanks to Mrs. Willoughby, Dallas Carter and Scott Harrison for sharing their awesome stories. Thanks to my Mom and Dad for instilling in me a love of books. Thank you to my sisters Mave and Kelly for their support of this project. Also, thank you to Jack Solomon for his Quora answer in regard to the statistics of being alive. Thanks to the team at Lift for creating an awesome tool to help me organize the writing of the book. And a big thanks to you for reading this.